The Florence cathedral is the fourth largest church in the world (after St. Peter's in Rome, St. Paul's in London, and the Milan cathedral). How long does it take to build something of such mammoth proportions and extraordinary beauty? 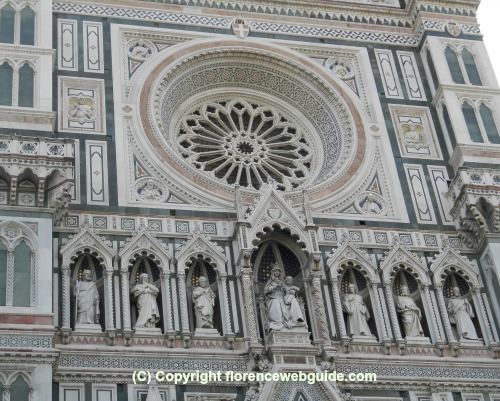 The official name of the basilica is Santa Maria del Fiore, which means ''Saint Mary of the Flower', but it is commonly referred to as the 'Duomo'. 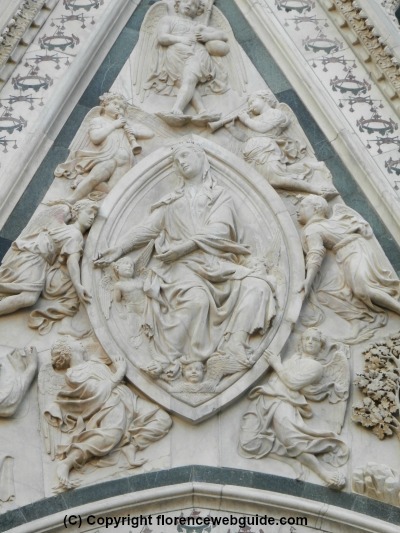 Mary of course is the virgin mother, and the flower is a reference to both Jesus and the city of Florence's Latin name of Florentia (=florid). The cathedral was started in 1296 by Arnolfo di Cambio who was assigned the commission of building a spectacular basilica for Florence. The city wanted to compete with neighboring towns of Siena and Pisa, and the goal was to make a church that would outshine these cities' impressive basilicas. 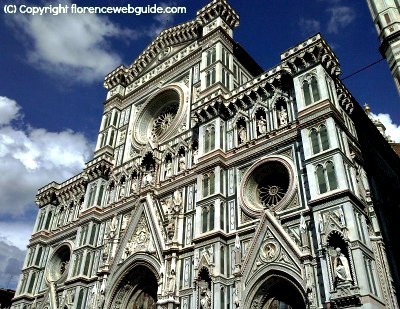 Looking at the Florence cathedral today, nobody can deny that this goal was certainly achieved. 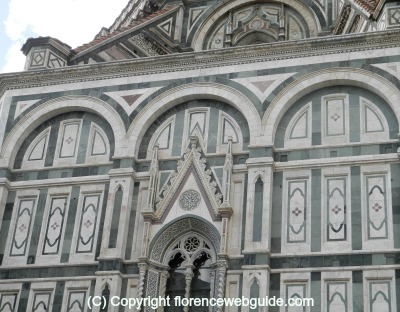 In reality though, the building of the basilica actually took much more than 140 years...read on about the most impressive of Florence churches. 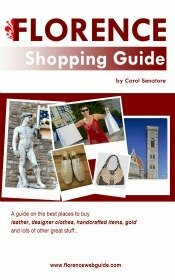 In the eleventh century Florence already had a main cathedral called Santa Reparata. However, after the building of a new baptistery right in front of the church, Santa Reparata was considered too small and modest-looking for a growing city like Firenze. Moreover, the neighboring cities of Pisa and Siena were expanding and building increasingly larger and more ornate religious and civic buildings. The Florence government felt something had to be done to beat the competition. Arnolfo di Cambio, architect of the moment (who also worked on Palazzo Vecchio and Santa Croce church) was hired to build a cathedral that would have no equals. The Wool Guild - one of the city's largest corporations of merchants - was put in charge of supervising the work on the church. 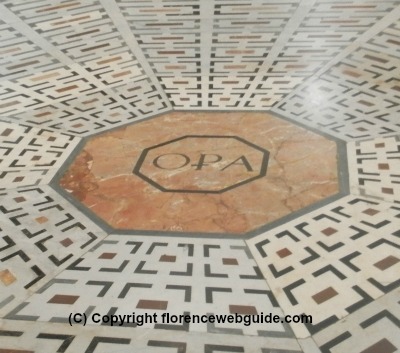 A special organization was set up to oversee all the work by the guild members called the Opera del Duomo (works of the Duomo), OPA for short (O - Per - A). 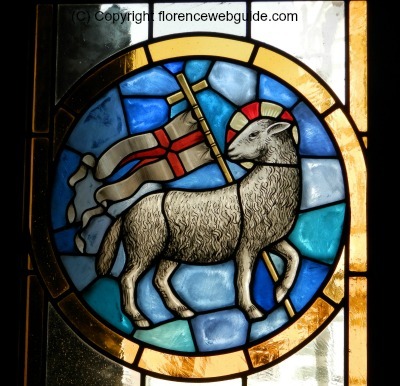 This is why - when you visit the Florence cathedral - you will notice the symbol of the wool guild in the church's decoration, a lamb holding a cross, the emblem of the OPA. Since the church took so long to build, di Cambio never saw his design brought to fruition however. After his death, construction was taken over by Giotto, then Andrea Pisano and lastly Francesco Talenti. The first stone was laid on September 8, 1296 and the cathedral was consecrated on March 25, 1436 by Pope Eugenius IV. The Duomo is entirely covered in 3 shades of marble: white, green and pink, all from Tuscany. Because of its geometric and striped pattern, it has even been described as a church wearing pyjamas! 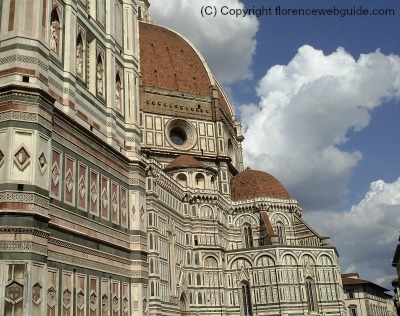 Although the Florence cathedral is for the most part Gothic, due to the long period of its construction there is also the influence of other architectural styles. The sides of the church have blind rounded arches, typical of Romanesque buildings, whereas the pointed arches of the doors and windows are Gothic. 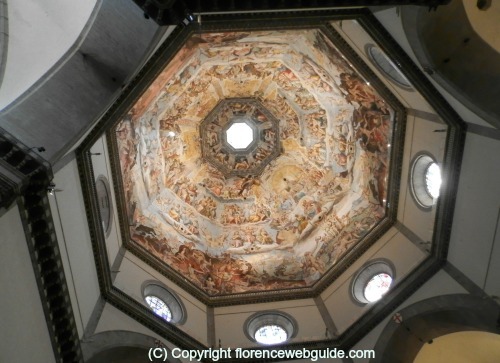 And of course, the cathedral's most emblematic feature, its dome - the cupola by Brunelleschi - is wholly Renaissance. Lastly, the facade is neo-Gothic, as it was only completed in the 19th century, 400 years after the consecration of the cathedral (more on this below). Below a detail showing blind rounded arches in Romanesque style yet pointed ornate Gothic arches for the window. 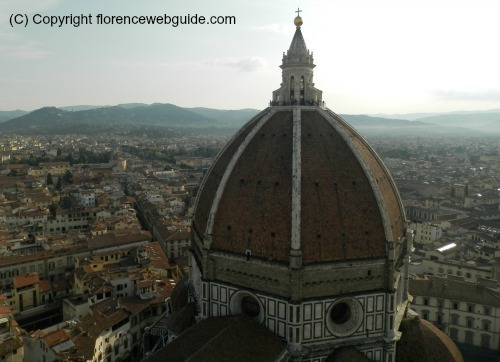 Below, Brunelleschi's dome, a mix of Renaissance innovation with classical elegance, the most admired feature of the Florence cathedral. 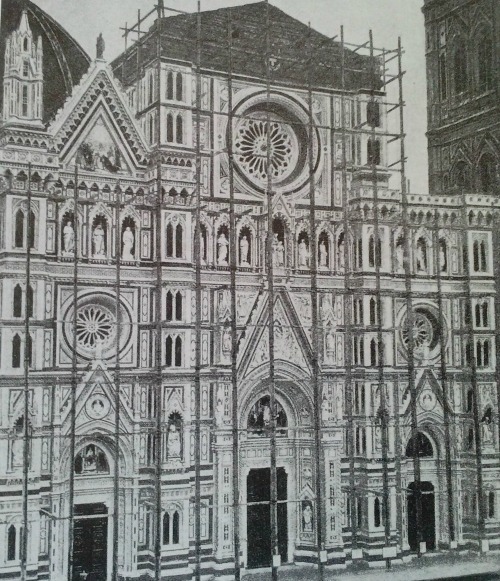 In 1868, architect Emilio de' Fabris won a competition to design the facade of the Florence cathedral. Although the church's original 13th century plan did forsee a facade, this had never been completed and was later deemed 'out-of-date' and abandoned. So although it was built in about 1875, the facade was meant to resemble the Gothic style of the rest of the church. Should the top of the facade finish off with pointed Gothic pinnacles and spires (like neighboring Siena's church) or should it be a simple flat top? To resolve this question, de' Fabris turned to the citizens of Florence. Both styles were erected - typical Gothic on the left and simple straight top on the right (see pic) - and then the people were asked to vote for their preference. 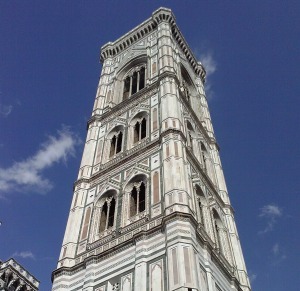 As we can see from the Florence cathedral today, the simple solution with no pointed arches was chosen. The new facade was inaugurated in 1887. The Duomo, especially the facade, is very 'busy'. Many of the same imagery repeats itself throughout the church, both inside and on its exterior. In keeping with its name, floral patterns - and especially Florence's iconic red giglio flower - cover the church as well as images of the Virgin Mary. 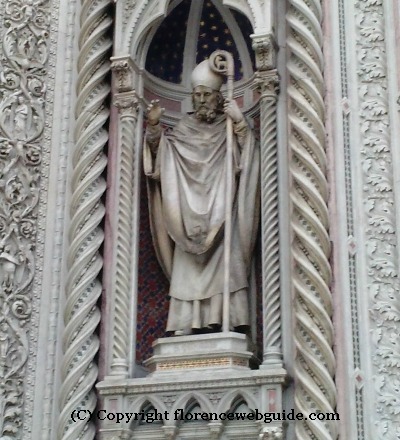 Other statues and decoration represent religious figures significant for Florence such as St. Zanobi (5th century bishop of Florence) or St. Reparata (christian martyr and name of city's first basilica). But the Florence cathedral was built on public funds and so there are also many pieces of art work dedicated to noteable Florentine citizens. 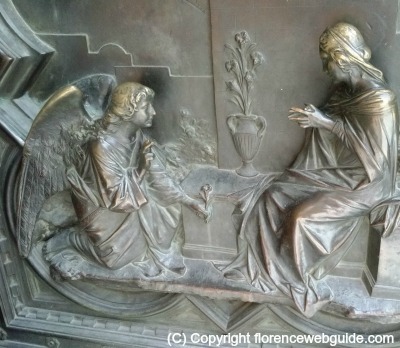 This relief on one of the huge bronze doors of the facade shows Mary receiving flowers from Gabriel, the angel of the annuciation. Below see the center piece of the cathedral facade with Mary in the middle and, on the sides, the apostles. 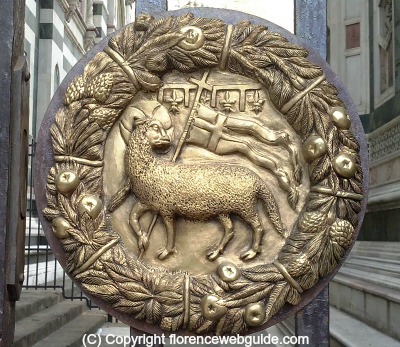 Below a statue of San Zanobi - Saint Zenobius - placed to the right of the center bronze door of the church facade. San Zanobi was the first bishop of Florence in the 400's and his mortal remains are buried in the church along with some relics. Below is an example of a non-religious figure represented on the decoration of the basilica. 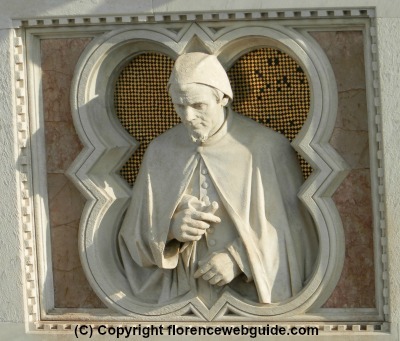 This is a sculpture of Andrea Orcagna, a renowned Florentine architect who designed Santa Maria Novella church. 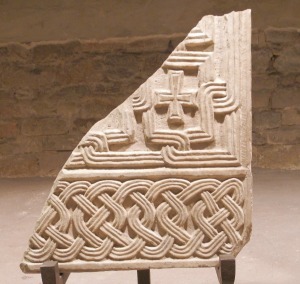 Pieces such as these however are usually relegated to the less visible parts of the cathedral, on the sides or very high up (this photo was taken from the top of the bell tower!). The coat of arms below is another example of non-religious imagery on the facade. On the shield is the 'People's Cross' representing the power of the citizens. 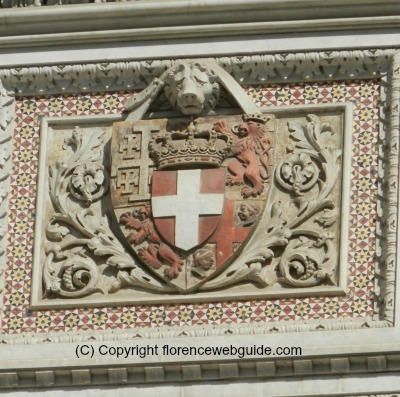 There are also 3 lions - one of the symbols of Firenze - 2 on the crest and one above it. Imagery celebrating the city and its people such as this illustrates that the Florence cathedral is not only a religious building but also a civic monument. 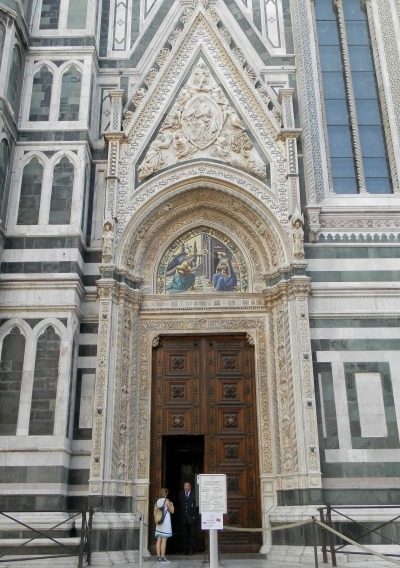 The Porta della Mandorla - literally translated as the 'Almond Door' - is considered the prettiest of the four side doors of the Florence cathedral. 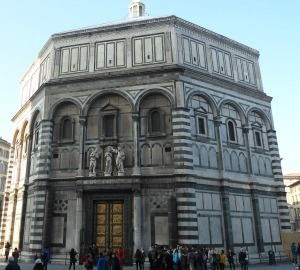 Looking at the basilica facade, it's the second door on the left side and is the entrance door to climb up the dome. The name comes from the bas-relief above the door which has an image of the Virgin within an elongated shape that resembles the form of an almond. The sculpted angels and image of Mary being transported up to the heavens carved within the triangular arch was done by Nanni di Banco and goes back to the early 1400's. 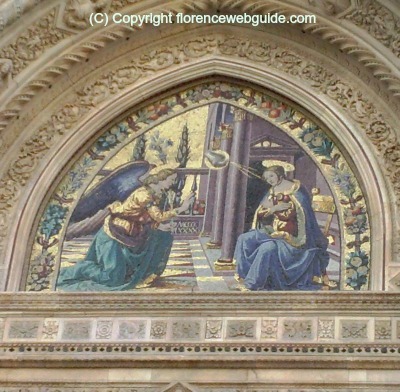 Also the mosaic lunette about the door depicting the annunciation is from the 15th century. The gold tiled mosaic has a Byzantine style and depicts the angel Gabriel announcing to Mary that she would give birth to a son. The iconography goes full circle as the marble relief above the mosaic of the annunciation depicts the end of Mary's earthly life as she ascends to the heavens. 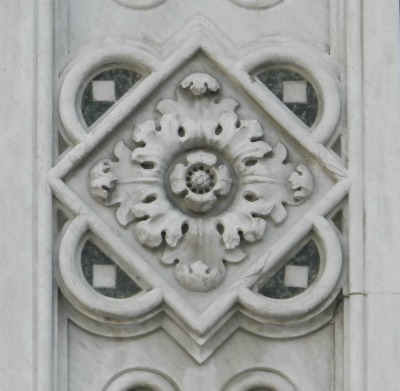 As mentioned earlier, much of the imagery and decoration on the basilica repeats itself. 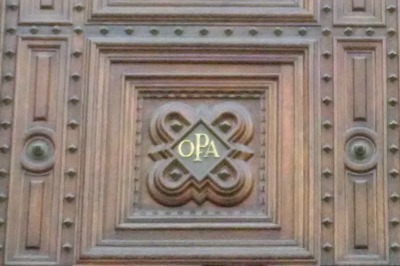 The wood carved doors on the Porta della Mandorla present yet again the emblem of the OPA organization, the Opera del Duomo, overseers of the church. Note also the barbed quatrefoil shape that letters are placed in. The quadrefoil is typical of Gothic architecture and is found on both the Duomo and the famous Florence Baptistery bronze doors. 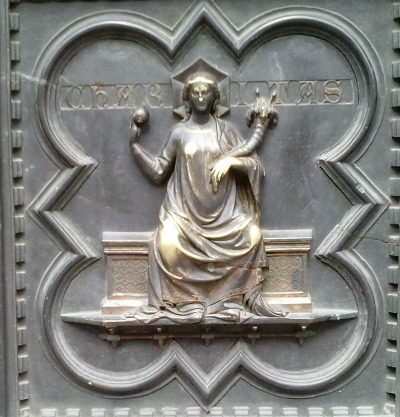 The first image is from the Duomo facade and the second bronze quatrefoil is from Andrea Pisano's bronze door of the baptistery. 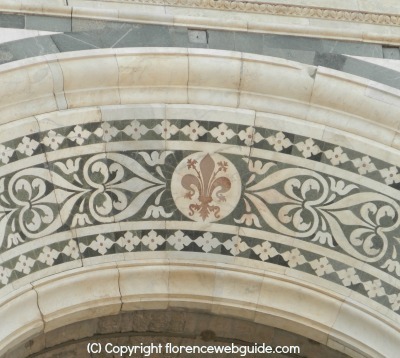 This continuity of imagery in the use of the quatrefoil was also found in our picture of Andrea Orcagna seen earlier on this page. Whereas the exterior of the basilica is a mix of styles, the interior is a classic example of Gothic architecture. Compared to the 'busy' exterior, the inside seems spartan. In part this is due to the fact that many of its former sculptures and art work have been moved to the Works of the Duomo Museum. In spite of this, the art work that has remained in the Florence cathedral was carried out by a list of names of the highest caliber in Renaissance art. Some examples include Donatello, Brunelleschi, Paolo Uccello, Verrocchio and Ghiberti. 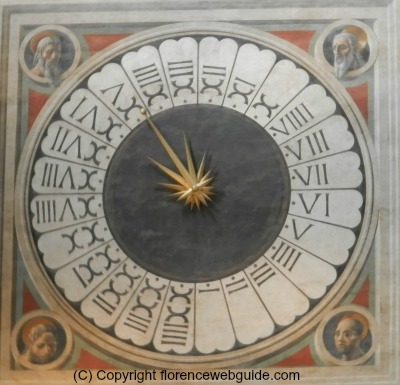 Below is the famous clock in the Duomo, painted by Paolo Uccello in 1443. Positioned just above the main entrance to the cathedral on the inside, this time piece is fully functioning and is one-of-its-kind. The clock face has 24, not 12, hours which are written in Roman numerals but in an anti-clockwise order. Unlike present-day clocks, here the 24 does not mean midnight but signals sunset (the end of the day before electric light was invented). This is known as 'Italian time' and used to be the way time was kept in Italy. One of the church's most admired features is its 44 stained glass windows, many designed by Ghiberti. Here below we see the Holy Lamb of the wool guild, association in charge of the construction of the church. 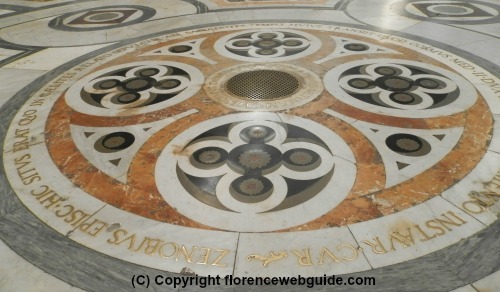 One of the prettiest features of the basilica is its marble floor. This type of joining of different colored marble stone is called 'Intarso'. 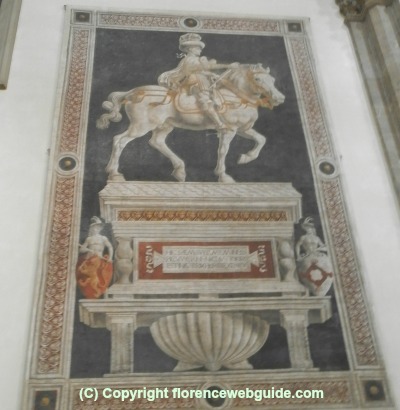 Remembrances of the 300 year rule of the Medici dynasty are all over Florence and the cathedral is no different. 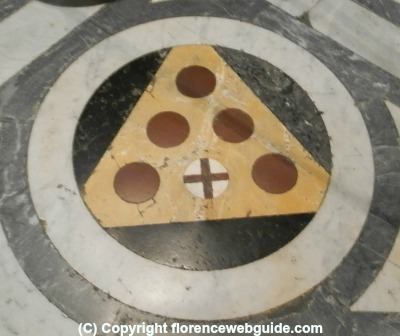 The red balls - crest of the family - can also be seen in the floor of the Duomo. Below see a shot of the frescoes painted in the cupola. The paintings illustrate the 'Universal Judgement', similarly to the mosaics in the baptistery. Like the baptistery, also the scenes in these frescoes are divided into circular sections. Universal Judgement was started by Giorgio Vasari in 1571 but finished by Zuccari in 1579 after Vasari's death. To get a closer look at this art work, a gallery was built which surrounds the dome and allows you to stand just under the frescoes. 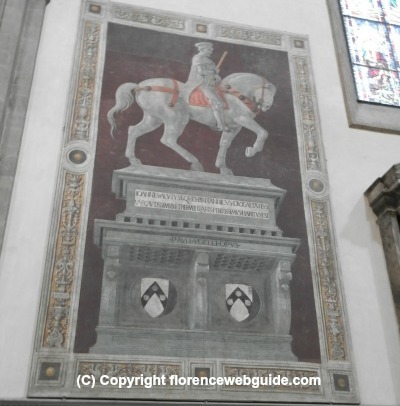 The interior of the Florence cathedral has several pieces of art that pay homage to illustrious citizens. The two wall murals below depict John Hawkwood on the left and Niccolò da Tolentino on the right. The two men were condottieri, military leaders, who fought to defend the Florentine republic in the 14th and 15th century. 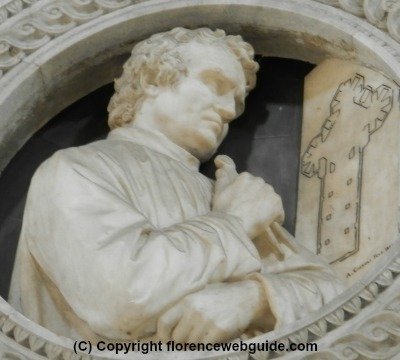 Below is a bust of Arnolfo di Cambio seen with his plan for the Florence cathedral. 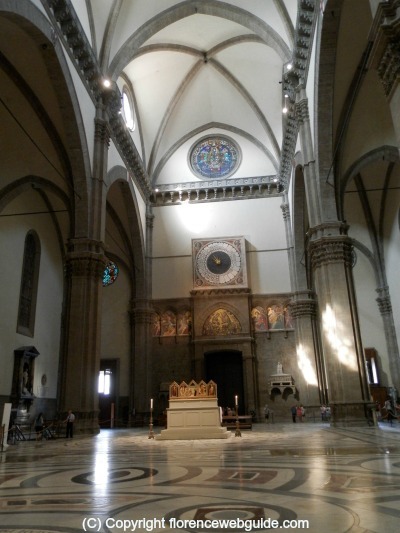 Inside the basilica are also busts of Brunelleschi, Giotto, and other significant figures in Florence history. 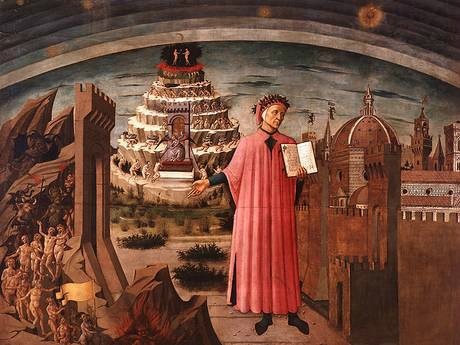 Dante was exiled from Florence due to his political beliefs and died in Ravenna. In an attempt to make up for this ill treatment of one of literature's greatest poets, the Florence cathedral pays homage with this wall mural depicting the 'Inferno', Dante, and Firenze. This is a detail of the Canon's Door which you might not come across since most visitors have no reason to go in through this entrance. Located on the right flank of the cathedral, this door has a novel aspect. 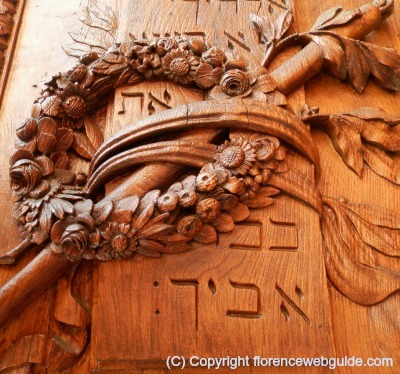 Apart from the magnificent wood carving, you can see that the message is written in Hebrew. This door used to be part of the facade of the basilica, and was moved to its current lateral position after the making of the bronze doors for the church front. Why Jewish writing on a Catholic church? There used to be a Jewish ghetto in Florence and the city had a large Jewish population (the ghetto, set up in 1571, was abolished in 1848). The writing on this door was meant to welcome the Jewish people who entered the cathedral. There is usually a longish line to go in to the basilica but it tends to move quite quickly. The wait does not usually exceed 30 - 40 minutes.